A diving pool and large “L” shaped pool for all ages, a kiddy pool for our young swimmers, and our adult pool complex with 2 whirlpool spas provide opportunities for recreational swimming, pool volleyball, aquacise classes, swim races, diving contests and more. 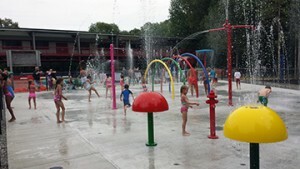 These pools are open from mid-May through mid-September (limited mid-week hours in spring & fall). 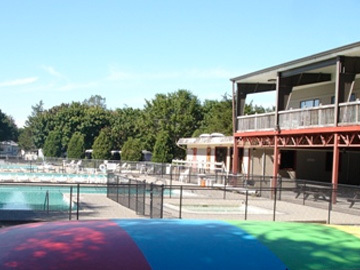 In addition, our Adult Rec Pool is now heated, and is available for family use during the early season (May 2 until June 20) and late season (mid-September until late October), along with an adult whirlpool spa. Please note that only USCG approved flotation devices are permitted. This prohibits the use of many swimming aids, such as inflatables, and we suggest checking any swimming aid for the USCG approval seal prior to arrival. Parents are responsible for the safety of their children–NO LIFEGUARD ON DUTY. These are for our adult campers 21 and over, and are open until 10PM during the summer season. Kids and adults of all ages and sizes can enjoy time under our new Splash Pad. Keeping you cool on those hot summer days! Featuring the latest in video games, pinball, billiards and interactive simulators, our fully air conditioned Arcade is open for all ages. 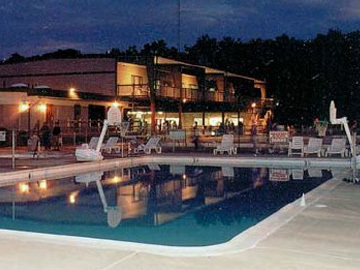 Our main activity venue, hosting Bingo, dances, Karaoke, crafts and more. 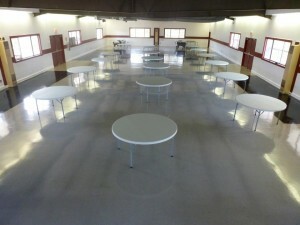 Seating for over 400 Bingo players, with a dance floor big enough for a whole lotta shakin’ goin’ on. In addition, our Rec Center stage provides a great setting for bands, magicians, hypnotists and other performers. The second floor of the Rec Center is climate controlled, and is ideal for hosting a birthday party, shower, reunion or other gathering, as well being utilized for movies, Wii tournaments and Bingo (when the weather is still chilly). Our food service facility, offering breakfast, lunch, dinner and snacks, as well as ice cream and other desserts, beverages and bagged ice. In addition, beverage vending machines are located throughout the Park. Menu information available here. Enjoy our newly renovated Climate Controlled Rec Center. With dart boards, ping pong, billiards and card tables, a great place to relax with friends. Also features our book exchange/library and a big-screen TV. Located adjacent to our camp store, our newly renovated facility offers washers and dryers on the premises to handle your laundry needs., with a second laundry now located at the Timber Trail restroom. Handling everything from basic grocery items and RV supplies, to souvenirs, firewood and local attraction information, our office is open from 9AM until 10PM during our peak season. ATM machine available. Our two large, fenced play areas for your dog to socialize with others. While dogs may be walked throughout the campground on roadways (please see our Pet Policy), “Strawberry Bark” offers a chance to play with other dogs off-leash. 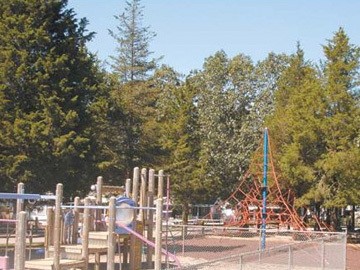 One of the favorite destinations for our young campers, we provide 5 playground facilities, with apparatus geared for a wide range of ages and interests, including new Spacenet Climber and Jumping Pillow. 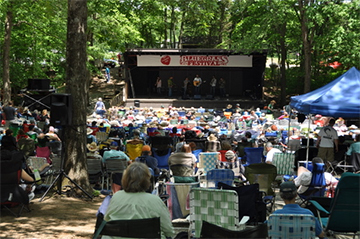 Site of our Bluegrass and Cajun Festivals , as well as special events such as our “Little Miss Strawberry Park” Pageant, our large Stage provides hillside seating for hundreds of festival attendees and two large dance floors. 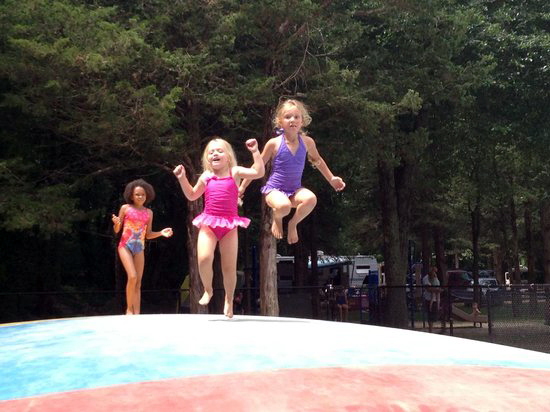 One of our most popular additions, we offer a jumping schedule for all ages…with the littlest jumpers for the 1st 15 minutes of every hour, followed by the 7-9 yr olds, then the 10-12 yr olds at the bottom of every hour…and teen/adult jumpers from 45 minutes past the hour until the top of the hour. These restrooms are open day and night, with sparkling modern facilities. A regulation-sized softball field, with an all-clay infield, provides our softball players with a top-notch playing surface. Also used for kickball, but due to insurance restrictions, we do not allow hardball (baseball) to be played here. 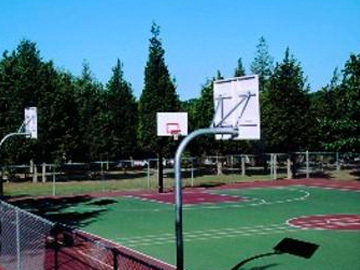 Our basketball complex features an NBA-size court, 2 side courts and 6 hoops at which to shoot. Our daily horseshoe tournaments frequently attract over 40 pitchers, with even more attending our annual Father’s Day Tournament and our Championship Weekend Tourney in the fall. Rapidly becoming one of our most popular games of skill, there are often over 60 players competing for the title, with teen tourneys, adult events and family competitions. Tossing a small metal washer into a hole seems easy until you try. Many players have their own washers (not the laundry type), while you can also borrow them from our arcade to have your own event. 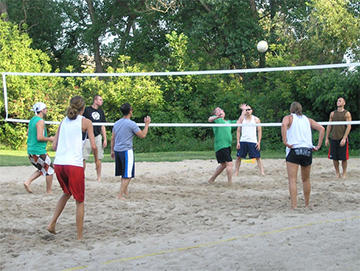 Join the growing number of teens and adults who play all levels of volleyball, from beginner recreational, to some highly competitive games, on our regulation sand courts. 2 regulation soccer goals provide soccer players of all ages a chance to hone their skills. Used not only for kids and teen/adult soccer, but also for Pillo Polo, Touch Football, Ultimate Frisbee and other field games. 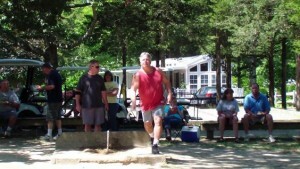 The site of our big Columbus Day Bocce tournament is also the location of weekly events featuring players of all ages. A great game of skill that even the younger players can try to master. Check out our 9-hole Disc Golf Course, located near our volleyball courts. Great fun for all ages! Bring your own Frisbee, or get an official competition disc at our campground store. Come enjoy our brand new picklebball courts. Fun for the entire family. 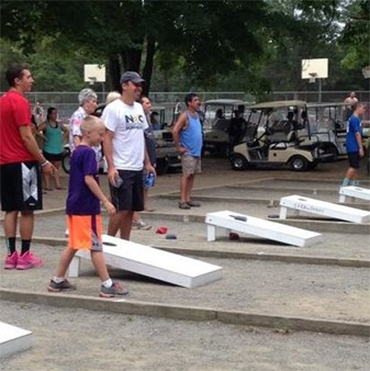 Come enjoy our brand new KanJam Games . Fun for the entire family. Our main gate handles express check-ins and visitors, while we provide an experienced security staff to help maintain the rules of the Park, such as nightly quiet hours and curfew for kids and teens. In case of emergency, our after hours line is (860) 334-9953. Please note that security cameras are in use throughout the campground, and you are responsible for the behavior of all members of your camping party. We are able to fill chassis mounted motor homes, as well as portable tanks for your RV or gas grill. Please be sure that your tank meets current codes, including the “OPD” style valve. Filling times vary based on the season, but we are unable to fill after dark. Firewood is available at the store. Firewood can be ordered for delivery to your campsite by calling the office. However, due to the threat of invasive species such as the Asian Longhorned Beetle, in accordance with the CT DEP, NO OUTSIDE FIREWOOD may be brought into Park. Free wireless internet is available throughout the Park (1 free hour per day—additional time may be purchased), and our cable TV system now features over 60 free cable TV channels at every site. Are you perhaps tight or stiff from too much softball or volleyball? Strawberry Park is pleased to announce a partnership with “Flying Hands Massage” to offer a variety of massage options during your camping stay. Choose from either a deep tissue massage or a Swedish massage, available by appointment for either a full hour ($70) or for a half hour session ($40) in our new massage room (located between the arcade and sauna). Or, if you prefer, poolside chair massage service will be offered (walk-ins only, no appointments) for just $20 for a 15 minute massage. This service is offered for those 18 & over, as well as teenagers 13-17 (with parental consent and parental presence). The summer schedule is for Tuesdays, Thursdays, Fridays, Saturdays & Sundays from 8am through 2pm, with spring and fall weekends. Book a massage service here. 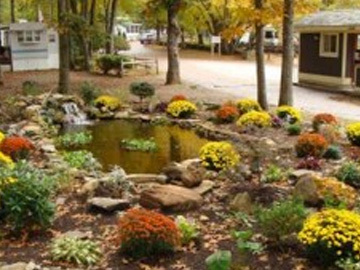 While registered campers may utilize our dumping stations at no charge, we also offer on-site septic removal. Campers must sign up for pump-outs by 9AM on the day needed. Emergency pump-outs are available, but will be charged accordingly, and will not be done after dark. Fee for dump station use by campers who are NOT camping at Strawberry Park is $30. Campers may elect to leave their RV at Strawberry Park between visits for a storage fee of $1.50/day. This is for dry storage, off a campsite, with no hook-ups. We do allow for free on-site storage of your RV between any consecutive weekend reservations in the spring or fall, provided the unit is unplugged. We are also able to tow your RV from storage onto your site—please make these arrangements in advance. If you would like your RV winterized, our service staff is able to prepare your camping unit for the winter months. Campers are asked to bring their trash & recyclables to one of the many receptacles located throughout the campground, including near the dump station, and behind the Timber Trail Restrooms. Single stream recycling means you do not need to separate your plastics, paper, metals and other recyclables), as that can all go into the recycling receptacle (either loosely or in a clear bag–no black bags into the recycling containers please). No bulky waste, such as old TVs, mattresses or tires. Please do not leave trash out at night. An emergency telephone is located behind the Main Office for 9-1-1 calls in case of medical, police or fire emergency. Phone messages received for our campers will be posted on our message board in the main office. We will do our best to promptly deliver any messages of an emergency nature. After Hours Emergency Telephone Number 860 334 9953. Located in our campground store (credit and debit cards are accepted at the store and the Grill & Creamery as well). 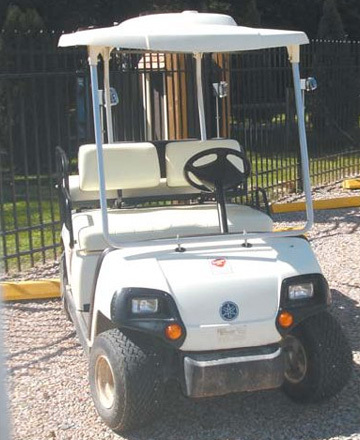 Adult campers may rent electric golf carts. For more information, visit our Golf Cart Rental page. Please note that campers are NOT permitted to bring in their own golf carts.